Make sure the L-tryptophan or 5-HTP or supplement you take passed our tests. Isn't your health worth it? L-tryptophan supplements are often promoted to improve sleep and mood, and 5-HTP supplements to help with depression. But there have been reports in the past of serious illness (eosinophilia-myalgia syndrome or EMS) associated with the use of certain L-tryptophan supplements, and even 5-HTP. So, do L-tryptophan and 5-HTP supplements really work, and are they safe to use? And which products are best? 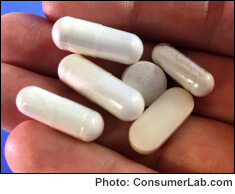 To find out, ConsumerLab.com recently tested popular L-tryptophan and 5-HTP supplements, carefully checking them to see if they contained their listed amounts of L-tryptophan or 5-HTP and whether they were contaminated with heavy metals or chemical impurities. We also reviewed the clinical evidence for and against L-tryptophan and 5-HTP. We identified a number of high-quality products. Among these we identified two that provide the best value (because L-tryptophan and 5-HTP especially can be expensive) — making them our Top Picks.